View-Master model C viewer - Brass Pendant 2002 - jewelry gift for VM collector! Here is a nice View-Master Barbie Prom Date Super Show Projector set that is new in the box. The projector takes 2 D batteries, and the set includes the 3 Barbie Prom Date View-Master reels. 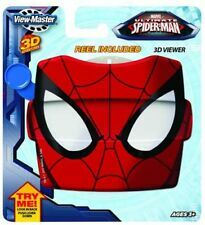 3D VIEW-MASTER AND 4 REELS,TITLES BELOW. 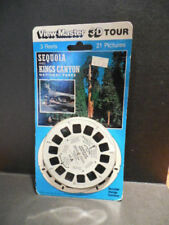 THE WALTONS View Master Reel Set. Sealed. Excellent!! 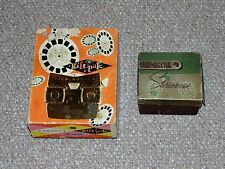 3D VIEW-MASTER AND 3 REELS,TITLES BELOW. Vintage 1950's Sawyer's View-Master With 6 Stereoscopic picture reels. In original box-excellent working condition. 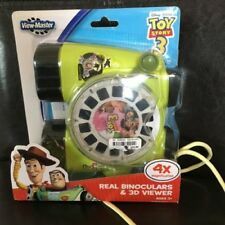 Cars 2 Viewmaster & Binoculars + 1 Cars reel, in working condition. 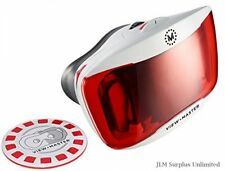 Your bidding on View-Master Superman Meets Computer Crook Reel Set from 1970. This reel set is in great condition, and the envelope is only missing the top flap on the back and its complete with book. Vintage View Master 3 Reels/booklet THE NEW MICKEY MOUSE CLUB. Excellent! Love Bug Viewmaster reel, 1968 sepia, good condition with minor scratches. NANNY AND THE PROFESSOR 3 Reels and Booklet. Excellent Condition! 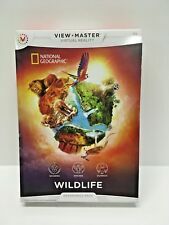 National Geographic: Wildlife - View-Master Experience Pack **used! !